First of all, there's not a lot of news on the knitting front. I've been in frog land, ripping and re-knitting a section on The Bean's Shrug three times now (aarrugggghhh). Nothing as bad as the Harlot's tale of woe (see her March 6 entry), but gee whiz - why couldn't I get it right the first time? Also cast on (Bad Grandma! Bad, bad, bad!) for a very plain rectangular shawl with some Lion Brand Homespun that was given to me several years ago...I really like having some "idiot knitting" (very plain and simple and either doesn't require a pattern, or is SO idiot-simple that even I can remember what to do) - hence the casting on of said shawl. But two things: first, this yarn is driving me slightly bonky - it's so filament-y and fuzzy that I constantly have to undo and re-do stitches just to get rid of those extra strands that hitched onto to the just-knitted stitch, and shouldn't have (extra credit if you understood that) and second, DD just about did back-flips when she saw the yarn (colorway "Quartz") - she loves it! So now I'm thinking maybe I ought to find a sweater or vest pattern for the yarn and make something she can wear. Hmmmmm. I counted 28 at one time! And they were all facing the house, their big red chests looking like ornaments in the bare branches. I didn't even try to take a picture...I just sat there and enjoyed the scene. A couple of weekends ago, Pookie looked out the same window at the same tree and said "Grandma, look at that bird!" 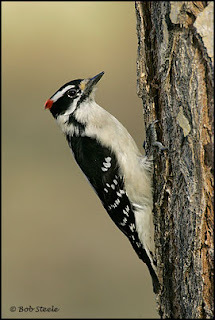 We looked up the bird in the "Birds of Idaho Field Guide" by Stan Tekiela and found out that we had a Downy Woodpecker in our tree. I have seen Downys in our tree on several occasions. They're beautiful little guys. 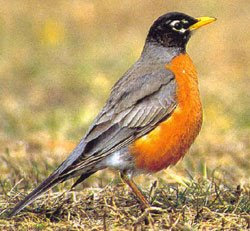 Several days ago I spotted a "new" bird at our feeders out front. We regularily see house sparrows, house finches, Juncos, and chickadees - and they all pretty much stick to our regular bird-seed feeders or ground feeding, but this new little bird was at the thistle-seed feeder and was much smaller than the other birds. 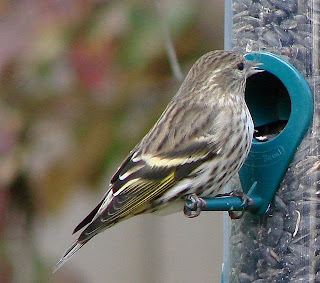 I think it was a Pine Siskin like this one. She says that since all the roosters were "dispatched" (by one of her Chicken Lady Friends), her remaining hens are super happy girls. 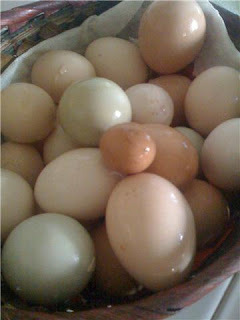 Aren't those eggs just gorgeous!